There will be MANY posts by me in that thread the next couple weeks involving the NCAA tourney - including complete player ratings (broken down into subsets) previewing every game. Mild warning flag on Terence and Perry Jones based on these ratings? Who else among the bigger names? Crow wrote: Mild warning flag on Terence and Perry Jones based on these ratings? Who else among the bigger names? I see a BIG warning flag with Austin Rivers of Duke - it's amazing how much press he got this year. I gotta tell you - man I was glad Davis ended up a strong #1 - because he ALWAYS looked awesome every time I watched him, in so many ways. That was my personal "laugh test" this season. Has there been a more impressive looking freshman defensively coming outta college (he's not just low post athlete either) - who, btw, appears to have massive upside down the road offensively too? Who are your sleeper picks for picks 25-35? I was thinking Jae Crowder even before I saw your list. Warriors could use a guy like that. EvanZ wrote: Who are your sleeper picks for picks 25-35? I was thinking Jae Crowder even before I saw your list. Warriors could use a guy like that. It's hard to say (25-35), we'll have to see who declares - and who vaults up the board. Derrick Williams was on no one's radar before last season, he ranked top 5 in my ratings all last season (finishing #3) - after his tourney play and teams started watching more video of him, he no longer was some sleeper. I have a TON of work to do with it - but I am hoping I can do some serious draft stuff after the season - using years of college similarity scores of my ratings that are adjusted for pace/SoS/etc. For sleeper picks available from 25-35 or later who might over-perform in the NBA, I'll take Kevin Jones, especially if the criteria is overall team impact (RAPM or just team win % improvement with vs without). If nothing else, the dude must be in great shape, playing 38 mpg. I've never seen such a high number. I'd think he'd make a fairly good choice by a good team if they have or can get the right pick in the second round to snag him. He will probably be a bench player but I think he could be pretty good at that level. Statman, good stuff. I love these kind of things. As the draft approaches I plan on posting my draft prospect rankings. I completely agree with you guys on Crowder he could be a really nice find in the middle of the draft. I noticed Mitchell Watt at 57 a head of some bigger name guys. It wouldn't be a shock if Watt goes undrafted but I do really like him as well. I think Tony Mitchell (the North Texas one) has a chance to be the steal of the draft if he goes where most of the mocks have him going. He's a bit of an enigma to me in that, on my scales, he has one of the highest unadjusted scores of the guys I've plugged in so far. However, the competition scalar lowers it considerably. The reason I say he's an enigma is one and done players don't usually come from mid-major teams so there's not much precedence here. Also, I see you have Harrison Barnes at 64. Not really high on him I take it? To me he has major warning flags and if I was picking in the top 10 I probably wouldn't touch him. I was sour on him last year and he actually scored lower on my scales this season. Sort of reminds me of Marvin Williams. 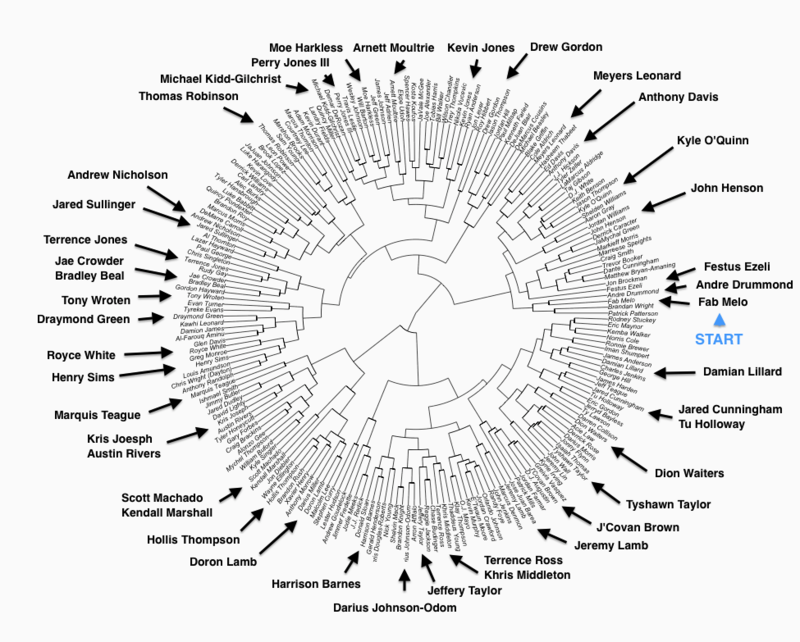 Statman, what do you think about my "player phylogeny tree"? EvanZ wrote: Statman, what do you think about my "player phylogeny tree"? I think I went cross eyed! Love the idea - it'll be real interesting if you could adjust for pace/SoS/ & class (or age). I have two different ideas in mind for my projections - first, using the last 13 college seasons of my ratings (which I am nowhere close to having done yet), with the ratings broken down into the various subgroups (after SoS, pace, etc) - and comparing the results to NBA players' college ratings using similarity scores at similar ages. Second is more complicated, and I'm not sure I could explain it - so I'm not gonna even try until I get that project posted. BTW Evan - do you have all the complete past 6 college seasons data? If so - I'd love to get it from you, to check for errors on the 3 seasons I have, and to get the other 3 I haven't bothered to try to get yet. I'd love to use your similarity measure to do this type of visualization. If you're game. Evans, did you compile those spreadsheets yourself or are they available on DraftExpress? I'm trying to find similar data for a larger pool of players. I just pulled it manually from DX.